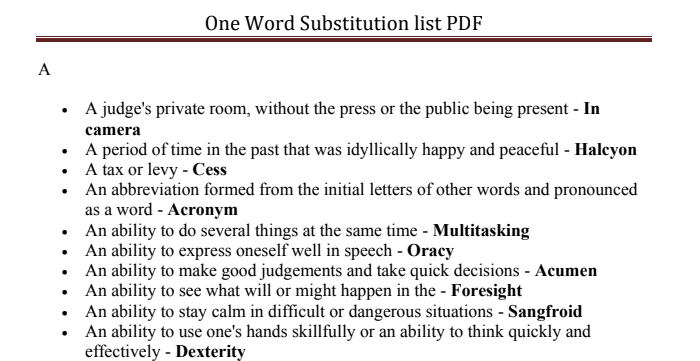 Dear Aspirants, Today we are sharing e-pdf of “One word Substitution in English Pdf Free Download” for all competitive Exams like SSC CGL, SSC CHSL, Bank PO, IBPS, other examination. Download One word Substitution in English PDF-E Book for All type of Competitive Exams. One word substitution for people. One word substitution for people for bank exams mcq of IBPS, SBI, RBI for PO and Clerk to prepare for english aptitude. One words substitution is an important part in bank exams, it takes less time, but it is scoring. So don't avoid this portion. Download E-book from the given link.